Influential American chef and food writer James Beard wrote over 21 books during the course of his career. Known as “The Dean of American Cooking,” he helped educate and mentor countless professional chefs. He died in 1985, but left a strong legacy in the food world with his innovative recipes and culinary excellence. And now there’s a recently published collection of his best recipes– The Essential James Beard Cookbook: 450 Recipes that Shaped the Tradition of American Cooking. I received a review copy and wanted to share a really delicious soup recipe I tried from this book–Lentil Soup with Chard and Lemon. You can substitute spinach for the Swiss chard, which is what I did, and I also added extra garlic to the recipe since I’m such a garlic-lover! It’s a fabulous soup–and it’s so healthy, too! I love the lemon flavor combined with with lentils, onion, and garlic. If a simple soup recipe from this book is so good, can you imagine how great the other recipes must be? I do have to say, though, that I think one of the reasons the soup was so great was because I used some very high quality olive oil from California Olive Ranch. They generously supplied me with several bottles so I could experiment with some recipes. They offer a great selection of olive oils that come in wonderful glass bottles, which I’m saving to use as vases after the olive oil is all gone! 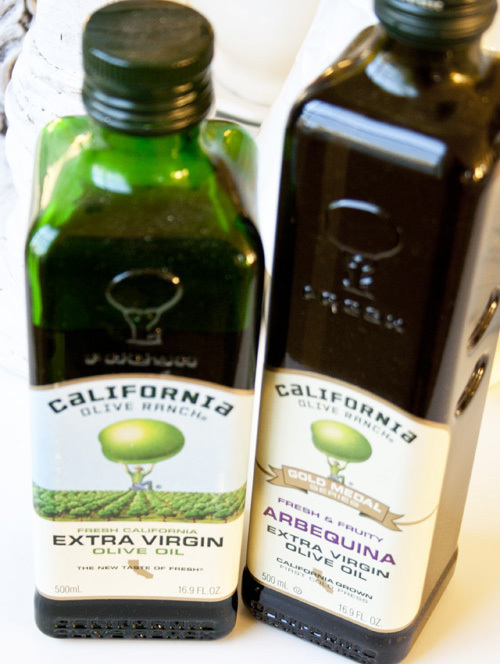 And I read that the distinct green California Olive Ranch bottle actually keeps their premium extra virgin olive oil fresh longer–another plus! Here’s the soup recipe so you can try it yourself! A rather different, Syrian version of lentil soup, tartened by lemon juice, that is also delicious served cold. Serve with crusty French or Italian bread. Put the lentils in a large saucepan, cover with cold water, and simmer, covered, until tender–between 30 and 45 minutes, depending upon processing; taste to see when done. Wash and chop the chard or spinach, and add to the lentils with 1 cup water. Cook until the chard (or spinach) is wilted. Meanwhile, heat the oil in a skillet. Crush the garlic with 1/2 teaspoon salt. Saute the onion, celery, and garlic until soft, then add to the lentils. Mix the lemon juice and flour and stir into the soup. Simmer, stirring, until the soup thickens slightly. Taste and correct seasoning. serve in soup bowls, with crusty French or Italian bread. I love lentil soup, and this is such a nice change from the lentil soup I usually make! Are you a lentil soup lover too? This entry was posted in Food and Recipes, Reviews and tagged Chard, Everyday, James Beard, James Beard Cookbook, Lentil soup, olive oil, spinach on January 14, 2013 by nancyc. Thanks so much for sharing this! I had a very similar soup at a restaurant with friends a few months ago and this sounds like the soup they served. I can’t wait to try it! I hope it’s as good as the one you had at the restaurant–you’ll have to let me know! olive oil and garlic with chard it has be delicious. Really want to try this recipe Nancy. Thanks for posting it. 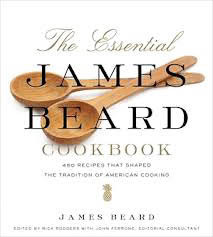 As much as I know about James Beard, I must admit I don’t know much about his books or recipes. Hope you enjoy the soup. Lee Ann! This was actually the first of his recipes I’ve tried, so I definitely want to try more! This looks delicious! 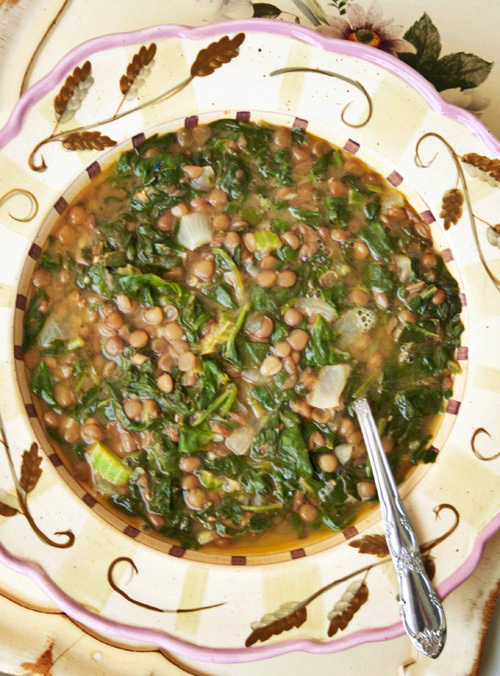 I love the combination of lentils and greens, so I’ll have to give this a try sometime soon.